I am happy to report our capital city, the thriving metropolis of Washington DC, shuts down roads and stops traffic for local food – and it all began with FRESHFARM markets. Shoppers at the Dupont Circle FRESHFARM Market (on the closed down 20th St NW). Yonkers was thus fertile and energetic ground for when FRESHFARM Board Member Nora Pouillon, of Nora’s, struck by the dynamic NYC Greenmarkets, suggested to her friend to start similar markets in DC. 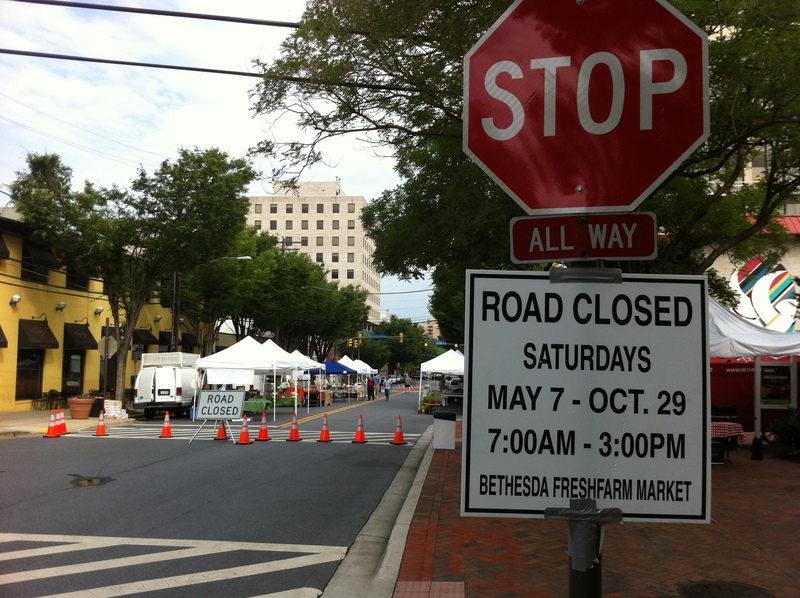 Bethesda FRESHFARM market continues the trend of food stopping traffic. 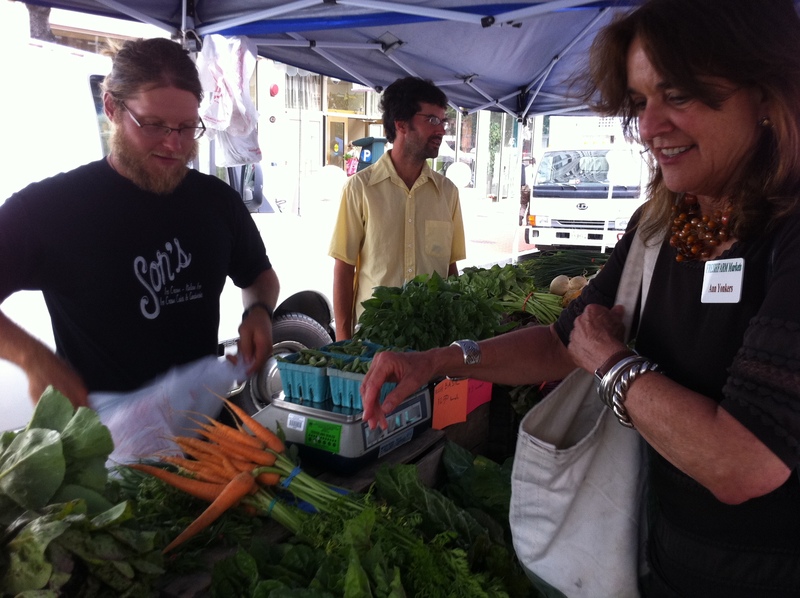 In 2002-3, FRESHFARM filed for 501c3 status and opened their third market – Penn Quarter. “It was a struggle” Yonkers recalled, “and part of the big struggle was getting that first market open with the permits to shut down the street.” The Penn Quarter FRESHFARM market location is awesome – tents and shoppers are cradled on a closed off block of 8th St NW between the Navy Memorial and the National Portrait Gallery, looking straight down the hill to the National Archives (erected in 1931 on the former site of Washington DC’s Center Market). So let us talk 2010 numbers. Over 360,000 shoppers purchased food from the 150 plus farmers and producers selling only what they grow, raise, catch or make at FRESHFARM markets. Over 9000 acres of Chesapeake Bay watershed is farmed to support that local demand. More than $19,000 in free food vouchers was donated to low-income shoppers – several of their markets accept WIC, Senior Coupons, and Food Stamps/SNAP Benefits. (Mark Bittman did a great piece on WIC recently in the NY Times.) Over 50,000 pounds of fresh food were donated to their gleaning partners (DC Central Kitchen among others). Ann Yonkers at Mountain View Farm at the Penn Quarter FRESHFARM market. 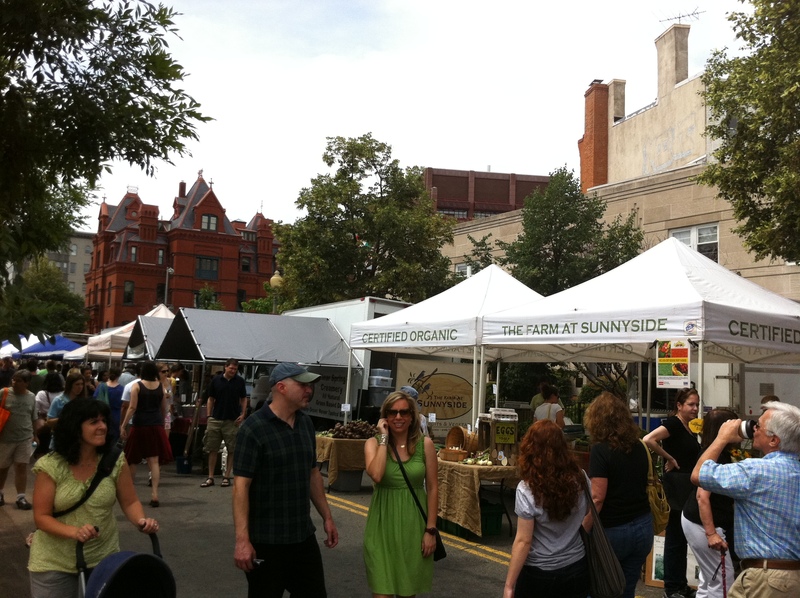 I agree with Yonkers’s statement that: “every market has its own vibe and quality.” Dupont Circle on Sunday is a maelstrom of activity and people. The buildings at Penn Quarter (Thursday) shade the chefs from local restaurants as they roll their carts up and down the street. Saturday Silver Spring’s central fountain spills cheer and community into the pedestrian village. I like markets where you can spend time chatting with the growers – perhaps Michael James, of Blueberry Hill, at H Street (Saturday) or Mary Haskins, of Haskins Family Farm, at Foggy Bottom (Wednesday). “We have seen a huge innovation in terms of what comes to market then when we started. Fruit, vegetables, flowers and plants – that was it – and now you can feed yourself.” Yonkers smiled. “The whole diversification – we never had any meat, any cheese, and milk – now we have all of these protein products that come year round.” Whether preserving food through cheese making or sauerkraut, growers are responding to the year-long demand, and FRESHFARM responded in 2010 by extending the market season to year long for Dupont and Silver Spring. This entry was posted in At the Market (farmers market) and tagged American Farmland Trust, Corinna Borden, farmer's market, farmers markets, FRESHFARM markets, Greenmarket, Real Time Farms, Washington DC. Bookmark the permalink.